This morning as I was driving into my shop, I had a little talk with myself. I keep a number of “talks” in my Tool Box – there’s the Story of Geraldine the Pig Talk (my daughter knows this one really well), there’s the You Catch More Flies with Honey Than Vinegar Talk (a little lesson I learned in my first year of marriage to The Nice Catholic Boy), the Get Back Up On The Horse Talk (another one my daughter knows really well), and The Come to Jesus Talk (trust me, this one is not what you think), to name just a few. 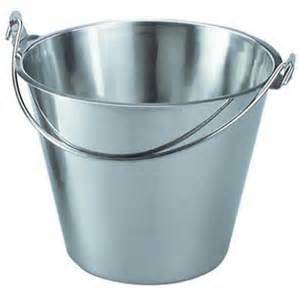 Today, however, my audience was, and is, just me … and I need the Bucket Talk. It’s the week before Christmas. One full week. Seven whole days. I am in the retail business. The catering business. The restaurant business. I operate a “brick and mortar” store AND an online store. There are 256 brand new emails in my “inbox” this morning. It seems like everyone wants “it” yesterday. I try very hard to be nice to everyone, all the time, because I really do love people. Sometimes, right in the middle of this season of Joy and Goodwill and Peace on Earth, some people forget their manners. They get demanding. They want what they want right now. They stop being nice. It doesn’t matter that they waited until the last minute. Or that everyone on this end of the phone is working overtime. I watch my little team of wonder women at Mon Ami greet customers warmly and serve them Grace, even when it’s hard to keep the Happylicious comin’. They patiently take orders for non-fat, sugar-free, no-gluten, no nuts, no foam, extra foam, hold the mustard, put tomatoes on just half, can you toast the bread, hold the bread, is there meat in the clam chowder, do you have vegan mayonnaise, can you mix the non-fat and the whole milk so I have a little of both, is it too late to change my order … and they do exactly what I ask them to do every day. Because we love people, and because The Boss Lady says that the customer is ALWAYS right, even when they’re wrong. I keep the door to my office closed because I need to respond to those emails without interruption, but it doesn’t matter. Another head pops in and says, “Hey, I know you’re busy, but do you have a sec?” The answer is yes, because I am in the people business, the service business, the public business, the what can I do for you business and how can I help business. It’s my choice. I picked it. I know why I’m here, and I know why I do what I do. I know that it’s not about me and never has been. I know I can’t be all things to all people all the time. I know there are only 24 hours in a day. I look at my warm and cozy shop full of happy customers sitting at tables and eating wonderful, nourishing food that we have lovingly prepared and served with Grace, and I know that behind my building, beyond the alley, there are homeless and hungry foks – human beings – who come down out of the trees and go through my dumpster looking for scraps to eat. I know that on Christmas, when my husband and I are surrounded with family and love and laughter, there are MANY in my little town who are not. I know that tonight, when I’m snug as a bug and tucked into my comfy bed, there are many folks – human beings – in my town sleeping outside, and they are cold. I know I am a small cog in the wheel of life. I know I can’t fix everything. Yep, I know. Sometimes it feels like what I do is just a drop in the bucket. It’s not good enough, big enough, quick enough. I have a bucket in my hands. That bucket is my life today – all the things on my To Do List, a project I’m trying to get off the ground, a need I want to meet, customers to greet, a worthy cause I want to take on, a problem I’m determined to solve, calls to return, emails to answer, orders to fill. Each time I take a step forward, I put a little drop in my bucket and watch it fall to the bottom. My contribution is, literally and figuratively, a drop in the bucket. I must keep my eye on the bucket in my hands. I focus on one drop at a time. There are times when I bring my bucket out into the open, and I ask my friends for help. They come with their containers, we fill the bucket together, we dump it into the pond, and its time to start over. There is ALWAYS another bucket. Again, my job is to keep my eye on MY bucket. I focus on the drop of water in my hand. I watch it fall to the bottom of the pail and I hear it “ping”. Then I go find a another drop. And another … because slow and steady will win the race. Eventually the bucket will get filled and the job will get done. And then there will be another one. Each morning, as I drive to work, I say a simple prayer. I thank my Creator for the life He has given me and the “bucket” He has placed in my hands. I ask Him to bless me and enlarge my territory. I ask Him to give me the physical strength to meet the challenges of this day, because I need it. I ask Him to bring people into my shop that need compassion and kindness. I ask Him to keep me alert so that I recognize those opportunities when they walk through the door. Because they will. They will walk in and step up to the counter and interrupt the person in front of them and order a triple-shot-no-foam-decaf-sugar-free-vanilla-make-it-extra-hot decaf-no-wait-make-it-half-caf-twelve-ounce-do-you-have-a-bathroom-I’m-in-a-hurry-can-you-make-it-quick latte. We will smile at them, greet them warmly, make them the best latte they’ve ever had, put an extra chocolate espresso bean on their lid to brighten their day, and wish them a Merry Christmas because that’s actually the name of the holiday we’re celebrating right now. They may not leave a tip. No worries … Just one bucket, the one in my hands. It will also fill a bucket, one drop at a time. A little past Christmas but a wise and inspiring word fills my soul one drop at a time–anytime of year! Love you my ! Friend.